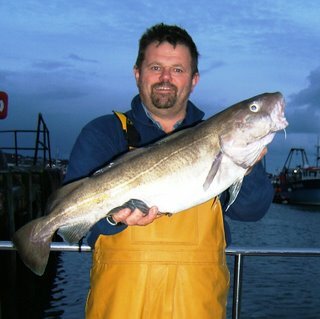 "Scouse" Pete Cowan 12lb 5oz Heaviest cod on charter boat in Poole Open Cod Comp. 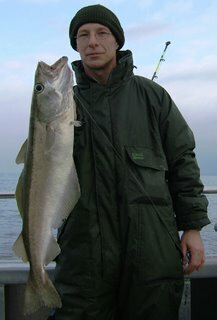 A big thank you to those of you who fished on Silver Spray in 2006. 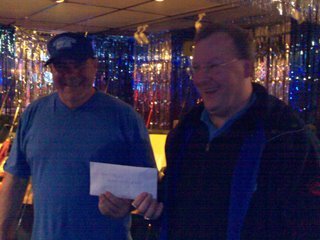 I wish you a Happy Christmas and tight lines in 2007. I hope to see you again on Silver Spray and to add more fish pix to this website! Well we managed a couple of trips before the weather fianlly brought 2006 to an end. 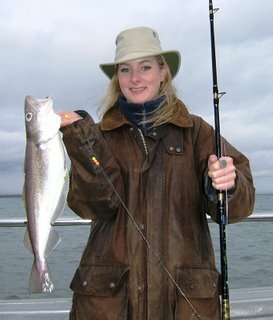 Thursday 28 December saw a group of local anglers competeing in the Poole Open Cod Competition. 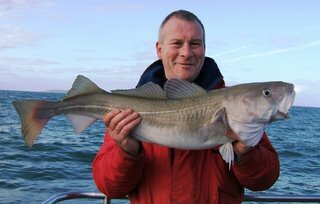 "Scouse" Pete Cowan caught a 12lb 5oz cod on a fixed spool reel a feat which gave Andy a few more grey hairs until the fish was safely in the net. 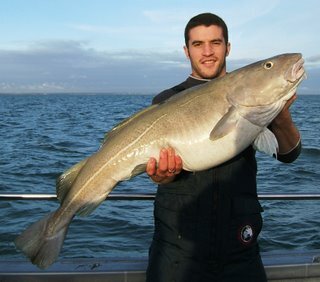 This cod was the heaviest in the charter boat section and Pete was delighted with his £500 prize! On Wednesday 27 December conditions were very good and a group of anglers from Wiltshire had amixed bag of congers, pollack, whiting and plenty of doggies. Phil Skate with a nice bait caught pollack - Phil is coming back to catch a relative in 2007! The whiting suddenly stopped feeding and the reason soon became apparent when Nick Briant's rod bent into a good fish which turned out to be a 33lb conger. 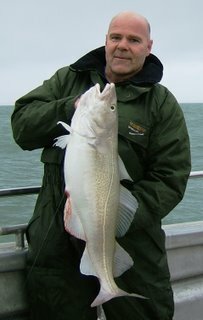 With the whiting slowing up in the ebb tide I decided to move out a few miles and position Silver Spray on a cod mark. The tide was really flowing hard and Nick switched to braid and after about an hour's wait he had what looked like the cod bite we had been waiting for. After a good scrap we were really suprised to see a 14lb ling in the net. A fine fish and quite unusual in such shallow water. Well when your luck is in its in. The tide slackened and Nick had another good bite. 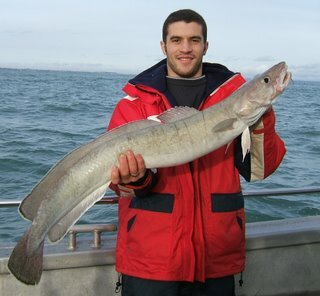 We had just had two congers on at once and Nick was sure it was another eel. After 10 minutes of patient work a huge cod broke surface. It was real struggle to get it into the big net but somehow it went in and was flapping on the deck. 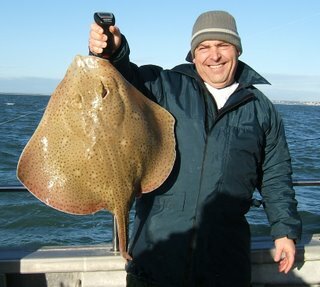 The fish was weighed officially at Poole Sea Angling Centre by Andy Robins at 31lb 13oz. 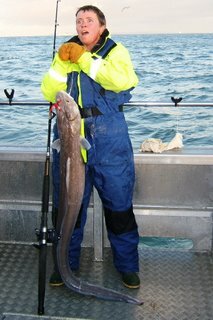 Nick reported that the cod really had a beer belly including an empty stella can together with a number of whiting! Finally winter weather arrives. 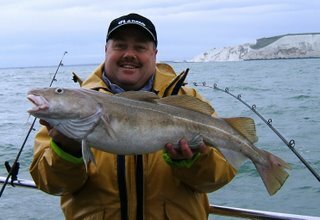 With more settled conditions we head out to fish on the slate beds off Swanage stopping on the sand for a few whiting Steve Haines with a 16lb blonde ray caught while whiting fishing. 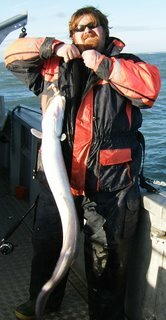 Wow thats heavy- Bridget Davies with her first conger about 30lb caught in a strong tide. What weather! Depression after depression means that everyday seems to have strong SW winds and that weather forecasts are even more unreliable than usual. 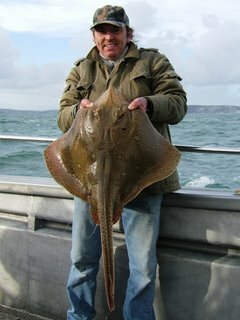 Paul Hathaway with a 16lb blonde ray caught off Swanage in a strong tide. The fish which put up a hard fight on light tackle took 15 minutes to land and was released. 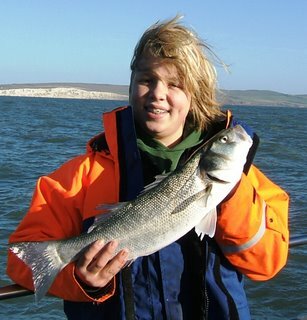 Jamie Russell with his first bass a hard fighting 5lb 4oz fish caught on baited hokkais on the IOW grounds.